Carol and Tom are friends of ours who have a long history of spending time on Kauai. They have more experience on Kauai than Linda and I have, so Carol has gladly volunteered to share her knowledge. We generally choose to spend our time in different ways while on the island. Carol and Tom enjoy relaxing type activities, while I am less inclined to relax for very long and prefer a more high energy approach after the first day or two. Information about museums and gardens and more relaxed activities comes from Carol, while I tend to know more about tours, adventures and shopping of all things! Together we offer a broader view of activities that you might find enjoyable. Our desire is that your time on the "Garden Island" will be rich with memories that fit your style. Another great source of information is the guest book in our condo. Guests freely share reports on their activities while visiting the island. These include activities, restaurants and general observations. Feel free to add your comments as well. A great website for additional information about Kauai is www.kauaidiscovery.com. Carol suggests the "Ultimate Kauai Guidebook" as the best choice for a guide to the island. The descriptions are usually accurate and suggestions very good. Linda and I keep a copy in each of the condos for guest use during their stay. However, we tend to use the assortment of activity pamphlets that are available at the airport and wherever people gather. Click here for a detailed map of all of Kauai's best adventures! Marv would strongly recommend that you consider renting a convertible during your time on the island. There is nothing better than traveling the island with a full view of the scenery around you. The price difference for a convertible is often quite minimal, but the pleasure you will enjoy is well worth it. However, as in most tourist areas, theft from vehicles is common. Remember not to leave valuables in unattended vehicles. If you are especially adventuresome you may consider a trip around the island, from one end to the other – just to say you did it! However, be aware that the road past the Pacific Missile Range to Polihale can often be very, very bad. If it has been raining, forego this part of the trip. It is a red dirt road, and the locals often make their money pulling people out when they get stuck. Be aware that most rental car companies prohibit travel on cane haul roads such as this. 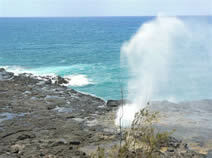 West along the south coast of Kauai from Poipu Beach will take you to Spouting Horn. Only a five minute drive, this is a popular site to visit. The park includes an outdoor market for those on bus tours and others interested in buying local items in a flea market setting. Several lookout points provide fantastic views of the “Grand Canyon of the Pacific”. 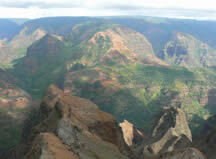 One of the more spectacular is the Waimea Canyon Lookout. Or if you enjoy hiking there are a variety of trails you can take to experience the beauty of the red rock and green vegetation up close. The colors are often more spectacular than the Grand Canyon in Arizona. Later in the day the canyon can become shrouded in fog. So the watch word is the earlier, the better. The red clay dirt is very slick when wet, so make sure you have a safe path back if rain looks likely. Koke'e is above Waimea Canyon. It is an absolutely beautiful place, full of hiking trails of varying intensity and length. Carol says that Koke'e provides a cool and inviting place when you need a break from the beaches. There are lots of birds, especially chickens! If you want a wonderful view from the Kalalau Lookout, be sure to go early in the morning. The lookout provides a view of the Na Pali cliffs from the top that is one of the most spectacular views on the island. The clouds can roll in and obscure the view later in the day - sometimes 'later' means 8:00am! 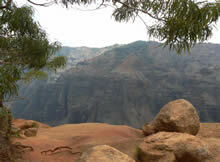 Marv says an early morning trip to the lookout followed by a hike in Waimea Canyon on a clear day makes for a great day. You can follow it up with some shave ice when you get back down to the town of Waimea. The Wailua Falls a pretty double waterfall, and the sight of the opening credits of Fantasy Island! Of course the amount of water is dependent on the amount of recent rainfall. This is a nice falls, with a heiau (sacred site) across the road from the lookout. Last time Carol was there, however, there were several local kids asking for money, etc. This is the only place on Kauai that they've ever experienced that. Carol says to include these in the list, but with a disclaimer. A cruise up the river with a commercial company is a very 'touristy' thing to do and she personally wouldn't want to do it more than once in a great while. However, it is an interesting trip, and gives you a different view of the interior of the island. The Fern Grotto is beautiful, but would be better without so many people! You may often encounter a wedding in progress, as this is a popular site for such events. An alternative would be to kayak up the river yourself - but don't expect clear, inviting water, it usually is rather greenish-brown. It is a short walk up to the lighthouse, with spectacular views and lots of red-footed boobies! This is the westernmost lighthouse in the U.S. This highly popular resort area is home to world class golf courses, and some up-scale shops. The Foodland store at the Princeville shopping center is a good stop for more of a selection of higher end products than most other stores on the island carry. Just on the west side of Princeville is the Hanalei Valley overlook, where you get a post-card view of the taro fields, north shore mountains, and the road into Hanalei. This is the wet side of the island with lush vegetation and a greater chance of encountering rain. Hanalei Bay is a beautiful circular beach and the home of Puff the Magic Dragon. This is a great place for sunbathing, a stroll on the beach, playing in the water with children, boogie boarding or surfing. If you are walking the beach at sunset, you may be lucky enough to encounter slack key guitar music by Doug and Sandy McMaster who often play at the Pavilion Beach Park. Doug is a master of this uniquely Hawaiian sound. If you want a very relaxing evening, be sure to attend one of their twice weekly scheduled concerts at the Community Center (www.alohaplentyhawaii.com). These concerts might drive Marv over the edge in relaxation, but Carol would say that he needs the experience! Hanalei town itself is a very interesting place, with a nice mix of stores, restaurants and shops to fit all tastes. The town has grown on Linda and me, and is a good place to people-watch as a diversity of lifestyles mix and mingle. If you want to put some fresh fish on the grill for the evening, the Blue Dolphin restaurant has a great fish market through the back door. This popular snorkeling and surfing beach is at the end of the road on the North Shore, where the Na Pali Coast starts. To get there is a rather interesting drive with lots of one-way bridges and curves, and during the winter you often have to drive through some small streams. There is a parking lot at the end of the road, but it is always very crowded. Click here for a detailed map of all of Kauai's best hikes! There are lots of places to hike on Kauai and lots of books on the subject. Koke'e is one of the best places, as well as the area inland from Wailua and Kapaa. Linda and I recently hiked from Koke'e out the Canyon Trail, where we took the photo below and enjoyed lunch at the waterfall a few minutes down the trail. Then, of course, there is the Kalalau trail. Carol says don't do it unless you are adventuresome, as this requires back country permits and at least a couple of days. The first two miles to Hanakapi' Beach or four miles to Hanakapi' Falls is a great hike, but will take a few hours. The trail is very slick if it has been raining and runs along the cliffs and through small streams. Carol considers the best snorkeling beaches to be Lawai Beach, Poipu Beach, and Tunnels Beach (if the rip tides aren't too strong). Check with the scuba shop in Hanalei to get a report on conditions for Tunnels. In the winter months, the north shore beaches are usually too dangerous to venture into the water, while the south shore beaches are usually open to swimming and snorkeling year round. Click here for a detailed map of all of Kauai's best beaches! 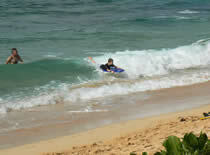 Of course there is Poipu beach at the front Kiahuna Plantation where our condos are located. It is a highly rated beach, and one of the best on Kauai. You can take surfing lessons or snorkel. Beach chairs, towels (free) and other amenities (room charge) are available at the Beach Hut on site. The state park is a short walk away with a sheltered bay for children to play and for snorkeling. There are lawn and picnic tables, as well as a nice sandy beach. This is a popular site for both locals and tourists. 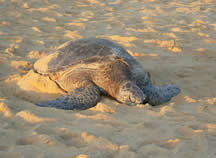 Monk seals and sea turtles (both protected species) can often found along Poipu Beach. During the winter months whales can be seen further out to sea. Carol indicates that the ponds are still in operation to recover salt from seawater. The beach is usually not that crowded, and usually has more locals than tourists and give you a flavor of the local culture. I would check with the locals about ocean conditions prior to entering the water. Other beaches are discussed in the "Places to Visit" section above. Linda and I most recently took a helicopter tour with Blue Hawaiian. We appreciate that their tour provides an up close feel of the spectacular sites. There are a number of reliable helicopter tour companies. Probably not a good idea to take a discount helicopter ride (or discount ziplining!). You would have to wonder where they are cutting corners! Linda and I recommend visiting the Na Pali coast with Kauai Sea Tours in their zodiac style rafts (www.kauaiseatours.com). You ride on the side of the raft for a fun, fast ride. However, it the sea gets rough you can take quite a beating if you are toward the front of the raft. They also have a wonderful sunset dinner cruise to the Na Pali. We have also visited on catamarans with Captain Andy's (www.napali.com) and Na Pali Explore (www.napali-explorer.com). 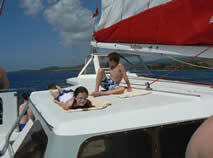 You will usually enjoy spinner dolphins and turtles, with whales joining the fun during the winter months. Even in rough waters the boat captains are able to maneuver near shore for a close up view of sea caves and other sites. On the return trip there is time for lunch and snorkeling. 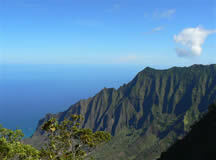 Carol feels that a trip to the Na Pali coast would be classified as a definite "must see spot". They like to go with Captain Andy as indicated in the "Sunset Cruise" section below. Carol and Tom regularly enjoy a sunset cruise on the south shore or a trip to the Na Pali Coast. Captain Andy’s (www.napali.com), Holo Holo (www.holoholocharters.com) and Blue Dolphin (www.kauaiboats.com) run cruises to both areas. They usually go with Captain Andy on the Spirit of Kauai for the sunset sail, but Carol says that the others are fine companies as well. Linda and I had a great time on the Kipu Ranch waterfall picnic tour. The guide was a young man who had grown up next to the ranch and provided an entertaining local perspective on the ranch, the island and issues related to life on the island. Much of Kauai is inaccessible to the general population and ATV tours on Kauai provide a chance to see parts of the Island that you just cannot see any other way. They do a good job of providing hands on training so you will enjoy a safe trip, so no worries there. This is a sightseeing tour, not a "rip it up" adventure. You can check them out at www.kiputours.com. Linda and I went on the tubing trip with Kauai Backcountry and had a great time. The guides were local young men who were fun and provided a local perspective on things. The trip floats down an old canal system off of Mt. Wai'ale'ale that was dug by hand over a century ago to provide water to a sugar cane plantation. This tour on the old Lihue Plantation provides access to the interior part of the island with spectacular views of Mt. Wai'ale'ale (the wettest spot on earth) that you wouldn't otherwise see. We recently took our grandkids on the tour, and they had a great time. Check out the tour at www.kauaibackcountry.com. Linda and I both had a great time zip-lining with Princeville Ranch Adventures on the northside of the island. Linda is the first to say that it wasn't scary, just a lot of fun. Lunch at a hidden waterfall and swimming hole made for a refreshing mid-day break. Our daughter and son-in-law went recently while we watched their children, Dillon and Sydney. They enjoyed zip-lining, while we had lunch at Hanalei followed by some playing in the water with the grandkids on Hanalei Bay. Access their information at www.adventureskauai.com. 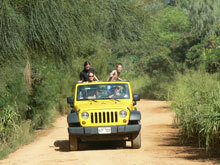 The other tour with Kauai Backcountry near Lihue is rated second by those we have talked with. Information about their tour is available at www.kauaibackcountry.com. This is the first place we go the morning after we arrive in Kauai! If you like coffee, you will love the Kauai Coffee Company. It is a fifteen minute drive from Poipu up the west side of the island. You can taste-test coffee to your hearts delight, and take the one of your choice back to the condo to enjoy during your stay. We also get a bag of chocolate-covered "Peaberries" for added pleasure! You can check them out at www.kauaicoffee.com. There is a nice variety of shops in the Poipu Shopping Village across the street from the Kiahuna Plantation. There is a new shopping center in Poipu, at the new traffic circle. It is gradually filling with shops, art galleries and restaurants, including Bubba's Burgers and McMennamins. The town of Koloa provides a local flavor of the Kauai lifestyle. There is a selection of shops along the "main street" of town. There is a nice local grocery store in Koloa. The grocery store in the Kukui Grove Shopping Center on the way out of Lihue is a good place to stop for major purchases, or going to Kapaa to Safeway or Foodland is a good option. For immediate needs there is a Whaler's General Store in the Poipu Shopping Village across the street from Kiahuna Plantation. Cost-U-Less is a warehouse style store and is located in Kapaa near the post office, just off of the highway. Of course, there is always WalMart in Lihue, which has a selection of groceries and most everything else you might need while on the island. And there is now a Costco store in Lihue. The Sunshine Markets are held all over the island, different places on different days. This is a great way to buy fresh produce - and can be quite a cultural event in the process. A schedule can be found at www.kauai.gov. When going to the Koloa market at the ballpark, be sure to arrive early and be prepared for the crush as it is a very popular event. Click here for a detailed map of all of Kauai's best dining spots! Recommendations of previous guests in the Guest Book at our condo is a good source of information on where to eat and not to eat. A few of our personal suggestions follow. Otherwise, take the advice from the Ultimate Kauai Guidebook as things can change rapidly in the restaurant business. On site at the Kiahuna Plantation is the Plantation Gardens Restaurant and Bar. Reservations are generally required. Across the street are a variety of restaurants, some better than others. In addition, there is also a popular restaurant called Joe's on the Green at the Kiahuna Golf Club. Favorite hot dogs are at Puka Dogs in the shopping village. They also now have shave ice. Roy's has established itself as a wonderful fine-dining experience, and often is selected as the best restaurant on the island in various polls. The nearby town of Koloa has a variety of shops and restaurants. They include Italian/pizza, a fresh fish market, and a variety of others venues. If you are looking for a good pizza, check out Brick Oven Pizza in Kalaheo. Favorite breakfast: Kalaheo Cafe. They also serve wonderful dinners several nights a week. The Camp House Grill in Kalaheo is also a good, inexpensive place to get a sandwich. There is a great restaurant with a local flare called "Grinds" at the junction of Highway 50 and the turn off to Port Allen. The Hanepepe Café is an excellent vegetarian Italian restaurant. It is open for breakfast and lunch, and dinners on Friday evenings. Reservations required for dinner as they book up early. Nearby art galleries are located in the Poipu Shopping Village, Kukuiula Shopping Center and Old Town Koloa. Friday is "Art Night" in Hanapepe. Galleries are open late and they make it a "community event". The Kauai Museum is on Rice St. in Lihue. It is a great place to stop on a rainy day, or anytime you need to get out of the sun for a while. It is an interesting museum where you learn a lot about the island. If you are there the first Saturday of the month, admission is free. On Fridays and perhaps Saturdays, the Orchid Society sells plants on the grounds - beautiful orchids, inspected for shipment, and reasonably priced. This is an interesting little place with lots of natural science information about birds, wildlife and plants. You can check them out at www.kokee.org. Both the Allerton and McBride Gardens are located in the Poipu area. Both of these are great gardens, with walk/ride options. Reservations are usually needed, and often several days or weeks in advance. Much of Jurassic Park and other movies were filmed here. You can check them out at www.ntbg.org. The Limahuli Garden is located on the north shore. It is part of the National Tropical Botanical Gardens, but a much different style. Limahuli concentrates on old Hawaii gardens that include taro terraces, etc. It is definitely a less visited garden than Allerton and McBride, but well worth the trip. However, it is on a rather steep hillside, and is an entirely "on foot" experience. If you go, plan on a fair amount of time because there is a lot of walking, uphill and down. Views are spectacular. Na 'Aina Kai is a private garden near the Kilauea lighthouse. It has only been open to regular tours for a few years. They take small groups of 9 at a time, so reservations are required. There are various tours offered, at various prices. There are lots of bronze sculptures. This garden goes from the hilltop to the beach, with lots of interesting parts and hundreds of orchids! You can check it out at www.naainakai.com. Carol reminds us that not only is the red dirt of Kauai very slick and dangerous when it is wet, but it also stains anything and everything - forever. You might want to check out the popular "red dirt" or "lava dirt" shirts available on the islands or online at www.silkgraphics.com.